In the cave the Prophet taught Abu Bakr the mysteries of the Divine Name. According to many gnostics this was the pivotal moment of teaching silent dhikr (zikr) remembrance practice. In certain sufi order that has their lineage from Abu Bakr, this silent remembrance is still a living tradition. Specially note worthy are the Impressionist Sufis (the Naqshbandis). When the Prophet migrated with his faithful companion and friend Abu Bakr from Mecca to Medina, they were pursued by the Meccans who intended to kill them, and by popular description, they were saved by divine will through a spider which spun its web over the tiny entrance of the cave where they had taken refuge. This web prevented those who were looking for the Prophet from entering, by producing the impression that it was pointless to continue the search in that direction, since no one had passed beyond the point. 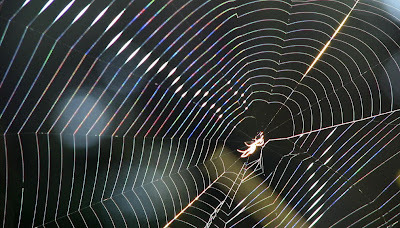 The spider web in the incident from the life of the prophet in the cave is spoken in terms of metaphysical reality. He went on to explain that the concentric circles represent transcendence, for they portray the hierarchy of the world one above the other; the Incomparability of the Self, Its Absolute Transcendence, is represented either by the outer circumference or by the center, according to whether we are considering the aspect of All-Embrancingness or that of Inwardness. The radii which connect the different circles one with another represent the Divine Immanence which enables us to make comparisons and to draw analogies. Each point of intersection of radius and circumference is a sanctuary of Divine Presence which makes it possible to say: "God is like that" or even "That is God"; and since every point on every circumference has virtually its radius which connects it with the center, every point may be the place of the manifestation of a Secret. But those who 'affirm beyond all measure His Incomparability' are those who consider only the circles; and they are 'the furthest of all men from their Lord' because in refusing to consider the radii, they are depriving themselves of all connection with God, and depriving this world of all symbolic meaning. Thus it is said, "It is not a question of knowing God when the veil be lifted but of knowing Him in the veil itself." Because on the Final Day when all of humanity will be gathered infront of their Lord for their requital, the Lord will appear and lift His veil, that day the knowledge and knowing will not benefit anyone. The gnosis of God, the recognition of God is valuable as long as you are in this world and in this world God is only known by His veil or in other word, by His Signs - because no eyes can see Him in this present reality.